Whether you’re already participating, or watching on the sidelines, you probably know that the goal of this movement is to get writers to draft a 50,000-word novel in just 30 days. In case you hate math, that’s a devilish 1,666 words per day. Writing a novel in a month is a wonderful idea. But it’s hard for a multitude of reasons, and the temptation to give up and just “do it over time” can be really appealing, especially as we approach Day 8 of the journey. But quitting, or choosing to simply abstain, is the worst thing you can do right now if you have a passion for writing. Quitting provides a shot of instant gratification. It eases the burden and seems to be the solution to a long-term problem. But giving up builds muscle memory. It is an active decision requiring only passive action. These passive choices get very comfortable over time, and our muscles—both physical and mental—get very used to it! Think about quitting a diet or an exercise regimen. Both choices require the lack of an action. Yet continuing the diet (choosing to shop for, cook, and consume healthier meals) requires conscious choices, rebuilding the muscles in your mind, stomach, and body. The same is true of exercising. Muscles are broken down and rebuilt over a long period of time, due to conscious choices. But if you choose not to exercise, the muscles still learn, and getting back to the gym only gets harder over time. Whether you quit NaNoWriMo or not, you are teaching your muscles. Make sure you’re building muscles you want to live with! Don’t quit. Because the “I’ll-Do-It-Later” muscle will never write a novel, never build an email list, never pursue guest posts and podcast interviews, never do readings or appearances, and never go all-in on the dream of writing and sharing that gift with the world. Don’t quit writing. The “I’ll-Do-It-Later” muscle will never write your novel. Have you ever read someone’s story and thought, I could do better? But then we sit down and try, and realize that it’s not as easy as we thought. This is the duality of Critic vs. Artist. When we sit by and observe, we are not investing in our Artistic selves. Rather, we are giving the Critic his day, allow him to safely watch and judge others, over and over. Here’s a great diagnostic for whether or not you are giving in to the Critic: Do you frequently say cynical or pessimistic things about other people’s work? Do you see the negative in everything? If the answer to either of those is “Yes,” then you’re probably spending too much time on the sidelines. So stay in the game, or get in while the month is young. Jump into NaNoWriMo today if you’re not already. Recommit if you’ve started to falter. And don’t worry about reaching the 50,000-word goal! What is your goal? What is your dream? Don’t care about what everyone else will think of you—they aren’t living your dream. Besides: Critics worry what everyone else thinks. Artists focus on telling a great story. This reveals a great deal about one’s character, because excuses are an easy escape route. When people let arbitrary rules dominate their artistic lives, they doom themselves to wishing and chasing rather than sharing and community-building. Perhaps your art is poetry. Why not commit to writing thirty poems, one a day? What if your medium is flash fiction? How about three pieces per day, totaling ninety in just one month? You could publish that, no problem. Or perhaps you’re the nonfiction coach, eager to launch a blog about something that fascinates you. Write and publish a post a day. Gather momentum. Share it everywhere. See what happens. We can’t let the “rules” of NaNoWriMo become excuses to quit or disinvite ourselves from risky, rewarding opportunity. Real artists, those who are wild about telling stories and sharing them with people, don’t let excuses hold them back. They bend excuses to their will and transform them into challenges. And challenges are thrilling because they always make us better. Don’t let excuses be your escape ramp. Don’t flee from the truth that your artistic future is truly in your hands, and your hands alone. Don’t worry about NaNoWriMo’s 50,000 words. Find your 50,000 words, whatever they may be. 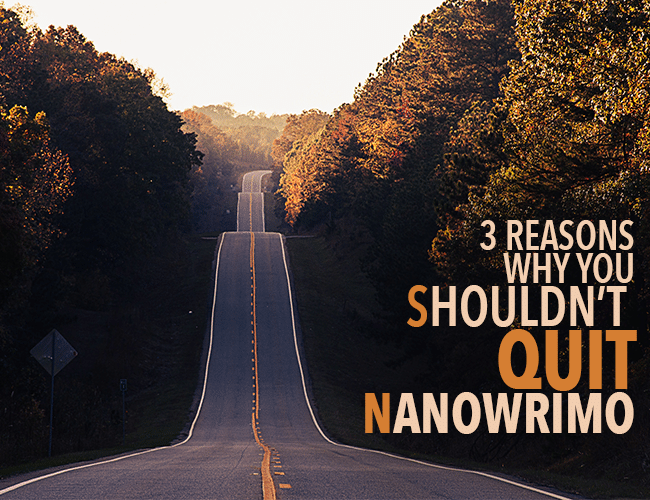 Quitting NaNoWriMo hurts more than just your writing. Keep going. It’s not about publishing a bestselling masterpiece. It’s not about taking advantage of your “one shot” at greatness. It’s not about impressing your friends or writing community. It’s about creating. It’s about community, encouragement, building, and finding our voices, within a word-requirement that will test our resolve to fulfill our calling. Something magical happens when we commit to our passion, hustle, and sacrifice for the goal of telling powerful stories that transform us into better people. It’s something life-changing, too: We mature, and transform into the men and women we long to become. Remember: NaNoWriMo isn’t about the word count, or the final product. Normally, we welcome comments responding to the post. But today, please only post work from the Practice. Commenting on someone else’s writing is a LOT easier than committing to the goals of NaNoWriMo, and I’ll admit that I often choose to comment rather than to complete the actual Practice. So please only post Practice, which I will do too! First, take fifteen minutes to work on your NaNoWriMo project, and share it in the comments. If this is your first day, don’t worry about saying so. Just write. Just begin a story. If you can’t think of a story, begin a memoir project, starting with an early childhood moment that began to form your self-identity. When you’re done, share your writing in the comments.